While all veterinarians are qualified to perform some surgical work, veterinary surgeons are specially trained and certified to perform advanced general or orthopedic surgical procedures on a variety of animals. Surgical procedures performed by the veterinary surgeon may be general (such as removing a tumor) or orthopedic (such as repairing bones in the leg) in nature. 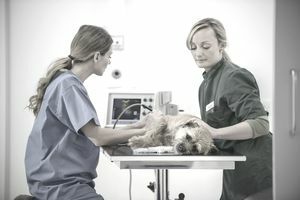 Routine duties for a surgeon in private practice include performing pre-surgical exams and diagnostic tests, evaluating radiographs and nuclear scans, using specialized equipment, performing surgical procedures, drafting case reports, supervising post-operative care, and interacting with surgical veterinary technicians and support staff. Veterinary surgery is one of the specialties in which veterinarians can achieve board certification. Veterinary surgeons in clinical practice may choose to focus on general surgery, orthopedic work, or a combination of both areas. They may also specialize by working with one particular species or a category such as small animal, large animal, equine, or wildlife. There are many other career possibilities a veterinarian can pursue In addition to private practice options. Veterinary surgeons may teach courses at a veterinary college, conduct and publish research studies, develop new medical devices and diagnostic tests, or provide professional consultations at the request of a general practitioner. Surgeons working in academia will have a variety of additional duties such as giving lectures, advising students, overseeing student research and supervising lab activities. Veterinary surgeons must start on their career path by gaining entrance to a veterinary school and successfully completing their Doctor of Veterinary Medicine degree. Once a vet surgeon has obtained a veterinary license he can pursue a surgical residency which provides additional specialty training in the field. In order to be eligible to take the board certification exam, a candidate must complete a three-year residency under the supervision of a surgical specialist, complete a one-year rotating internship, conduct and publish research in a scientific journal and document the achievement of specific curriculum requirements through case reports. Upon passing the rigorous board certification exam administered by the ACVS (consisting of oral, written, and practical segments), a veterinarian will be granted diplomate status in the veterinary specialty of surgery. Diplomates in the field must complete continuing education credits each year to maintain their status and to keep current with advances and developments in the surgical field. Board certified specialists would earn salaries even higher than the top end of the compensation scale among medical fields, but unfortunately, the Bureau of Labor Statistics (BLS) does not separate specific salary data for each of the veterinary specialties. Median salaries for veterinary surgeons are typically in the low- to mid-six figure range. The Bureau of Labor Statistics (BLS) does not separate the specialty of veterinary surgery from salary data collected for all veterinarians, but it does project good growth for the veterinary profession as a whole from 2014 to 2024. The BLS data indicate that the field of veterinary medicine will grow at a rate of about 9 percent, slightly faster than the average for all professions surveyed. Those who are able to achieve board certification as surgeons will be in high demand and should readily find desirable positions. The rigorous nature of specialty training programs and board certification exams ensure that only a limited number of professionals will be able to attain board certification each year. The ACVS reports that, on average, only 70 candidates achieve board certification in the surgery specialty each year. The limited number of board-certified professionals in this veterinary specialty should continue to ensure strong job prospects in this lucrative field.